Welcome to my second article on bad games with good cover art. In the first article, I explained that this disparity isn't terribly surprising, because group A makes the game, and group B makes the cover. However, I've seen other people who write about video games start their articles with extensive historical notes, as if "reading and regurgitating facts" makes them important. So to that end, I'll put a paragraph here that seems to do the same (I'm pretty sure everyone scrolls down to where the pictures start anyway, so its an academic point). The origin of species ye videoe game: in 1878, Baron Whatson Von Siggurd commissioned Ye Visual Parlour Trickes Goodfellowes Venturative Consortum, and began mining the mauve hills of Mepos for what is today known as "video game ore". When struck with one-quarter francs, this video game ore gave off sparks that were said to be "most pleasing to all who beheld such," and became a "favoured amusement" of the court of Viscount Harley of Race. Several decades later, people refined video game ore into a primitive Nintendo Amusement Platform (NAP). One day, a careless handmaid left a NAP system in a movable-type printing press and then a coal miner spilled bromide of soda on it, and the Nintendo Entertainment System was created. Dash! Woh-oooh-oh! Saves every one of us! Mr. Galaxy is clearly a ripoff of tribute to old timey science fiction pulp heroes of the 1930s. On the cover, he's depicted sporting a snappy jacket, aviator goggles (before they would become mandatory XTREME-wear), elbow-length gloves and knee-high boots. And Dash is exploring a location that must be every bit as exotic as he is, judging by its name: an Alien Asylum! Evidently this means he must out-run pterodactyls and little grouchy snake-faced monsters, and this excitement takes place in an antiseptic metal innards of a space ship. ...and did I mention he's wearing Jodhpurs? Generic Blue Jumpsuit Dude manhandles boxes in a warehouse. I think the second-most frustrating thing* is the disconnect between the "box-pushing levels" and the "camera-collecting platformer levels". This is one of the few games that I owned once, then sold because it was no fun, then recently bought again and made an honest effort to make some progress. *: the most frustrating thing is, "you have no basic attack", but I guess that's not too unusual in this Jumpy-McJumps-a-lot genre of games. In my second or third try, I'd learned that you can skip a lot of the platformer levels and just repeatedly go upwards in the ship via the elevator (that pyramid-y thing in the bottom left corner of the box-level picture above). Unfortunately you can never go back DOWN the elevator, and periodically you'll need Keys or Bombs to get past zappy-walls in some of the box-levels. I then tried to figure out how to visit just enough platform-levels to get the keys I needed to survive riding the elevator higher and higher, and then...nothing. The highest floor you can go to by normal elevator means is Floor 9, and there's nothing different or special in any of its box-level or platformer-levels. I had to go to the FAQs to discover that you're really supposed to be finding "hidden doors", which warp you to other rooms/floors and can be opened up in platformer-levels, or when you do specific (non-obvious) things in the box levels. The goal is to get to a specific box-level floor, which contains the ship's exit/game's good ending/etc. This specific floor a) isn't the top floor, and 2) several of the steps required to get to that floor can only be achieved by those hidden doors. So, we were promised heroic running-and-alien-dodging, and we received...a muddled AD&D: Heroes of the Lance in space type of game, with horrible controls and incredibly unclear victory conditions. Snakey Bio-Mechanical(?) Monster = toddling gunmetal-blue bowling pin. Flashy Old Timey Space Hero = Jump-Man's noodley uncle in coveralls. Indeed, the inmates are running the (alien) asylum. Sorry, Cover-Art Dash: your advertised adventure is in another cartridge! 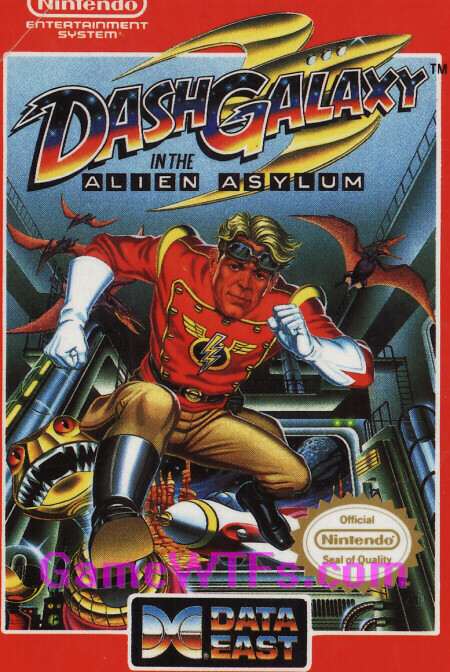 The cover art Dash Galaxy looks like The Rocketeer. I was going to say that they're both generally based on the 1930s Flash Gordon/Commando Cody types, but the red jacket and brown pants are spot-on for The Rocketeer.